What is Fairy Ring Lawn Disease? Fairy ring is a lawn disease that consists of groupings of mushrooms that grow in strange-looking arched patterns. 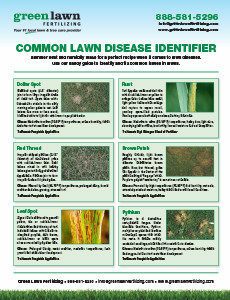 Caused by certain types of fungi, this lawn disease tends to occur during warm, wet weather. Here’s more about this stubborn lawn affliction. The mushrooms that make up a fairy ring usually grow in moist, well-watered areas of a lawn, forming arc-shaped designs with dark-green grass beneath them. The arcs often grow together to form rings that range from 3′ to 20′ in diameter. As they form, they kill the grass in the center of the ring they made. This results in circles of dead, yellowing grass in your yard with dark-green outlines. Fairy ring often shows up in the same spot every year. It can also cease to appear for years at a time before reappearing unexpectedly. Buy a lawn fungicide product that contains dichlorophen and read the instructions carefully before treating your grass with it. Destroy the mushrooms by cutting them at the base and burning them to prevent their spores from spreading. Mow the diseased area separately from the rest of the lawn, burning the clippings to prevent the spores from spreading. If all else fails, it might be necessary to dig up the affected area and dispose of the soil. Then cultivate the new soil before you resod or re-seed completely. If removed, the soil and mushrooms must be destroyed because they contain spores that can easily become airborne and infect other parts of the lawn if they aren’t properly disposed of. Either burn the mushrooms or put them in the trash. Affected soil must be sent to a landfill. Do not add soil or mushrooms to compost piles or keep them anywhere on your property. At Green Lawn Fertilizing, we know how to deal with every lawn disease under the sun. Our qualified lawn technicians are talented at remediating diseases and maintaining healthy lawns. Give us a call today at 888-581-5296 for a free estimate.